Okay it’s Friday and I’ve got nothing for you. Well that not entirely true – I have a question for you. If you had to conduct an interview, with absolutely no time to prepare and were allowed to ask only 3 questions, which questions would you ask? What are your go-to questions that will tell you what you need to know about a candidate? Hoping to hear from you in the comment section. Sometimes really cold snowy days make me think of being a kid stuck in the house with NOTHING to do. Actually, this isn’t true – I relished the idea of being able to sit around and read or play board games. But sometimes even that would get old, so I would pull out a deck of cards and endeavour to make the tallest house of cards that I could. Handling cards and arranging them into a tower is an art. You had to ensure that the base wasn’t too slippery (carpet worked well) and you had to use really worn cards…preferably sticky from overuse (yeah…gross, I know). Then you started building layer by layer until you got to the point where you literally had to hold your breath as you placed each card. And heaven help the idiot that inadvertently created air movement within a 2 m radius of the structure. At some point a card would give in the middle layer and I would try to re-position it or remove it without affecting the overall structure. And you could get away with this with one or two cards, but beyond that the house of cards became too unstable and collapsed, leaving you with a pile of cards to clean up. 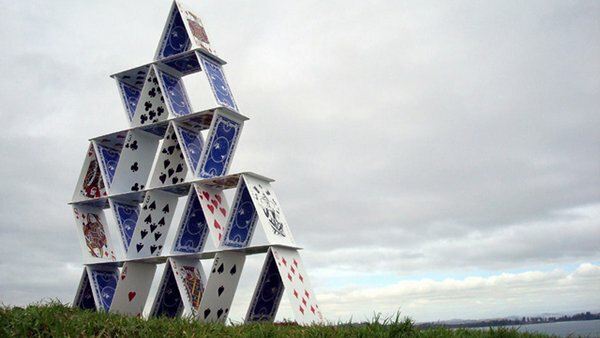 Dealing with changes in the workplaces has a striking resemblance to building a house of cards. Although it’s not intentional, it may appear that management is playing a similar game when making these decisions…adding layers and keeping anyone from coming near the table. Now, I may only be in HR; however, I understand operational needs, but more importantly I understand consequences. And the reality is that you can only re-position, remove, and restrictso much before you weaken the structure. Because despite being really worn (and potentially sticky) these are employees, not cards. And 52 pick-up is not the same game when you are dealing with people. Damn, I forgot to put the out of office alert on my blog. I always do that. I have been working, I swear – I know you have your doubts about the productivity of people who are not in their seat all day, every day, every week, every month…but it’s true, some of us have figured it out. Am I right? Now, now – that’s not very nice. I might get the impression that you don’t trust me. Perhaps you are also thinking that I wasn’t really working while I was at the conference, after all HR people are notorious for well…let’s just say, what happens in the “AODA: What You Need to Know for Private Sector Organizations”, stays in that session. It’s true, over 3000 of us were sitting, listening, walking around, chatting, and generally having a good time. However, often what I came across were people scrambling for charging sessions so that they could log in to work, people coveting chairs and corners where they were making scheduled calls with clients, and even more had to leave sessions early to deal with issues that had come up. As one participant shared with me, it’s like no one needs us or cares if HR is at work until we aren’t there. In my regular blogging job, I generally sit down and type out whatever idea has been brewing in my head for days – I write the way that I would want to read it. I do a quick once over and hit publish. This quick and dirty method will not be a surprise to anyone who is a regular reader of my blog (as illustrated by my grammar / spelling errors). I really don’t concern myself about who or how many people will read it. However, my time at the conference created a completely new and uncomfortable blogging experience. Not only was I in information and idea overload, but I also had to write with deadlines and I did have to concern myself about who was going to be reading my posts. Add to all of this the fact that I was contributing alongside some really great bloggers. My initial post reflects this perfect storm. I couldn’t decide what to focus on, I spent most of my sessions thinking about what information I could use in the blog, and then I tried writing it in bits and pieces throughout the day. And truthfully, I felt like I couldn’t even write in my own voice, after all, who I am to write about HR. And then I was up late at night re-writing, fine-tuning, over-analyzing, and second-guessing every, single. word.Then I hit publish. After reading some of the other posts – I needed to take a step back. I had to change my approach. It’s not that I felt intimidated by the other bloggers – I was inspired. We chatted about what we were writing about, shared ideas, and supported each other. Truthfully they made me think more about my content and style, but at the same time made me realize that I could improve these and still use my style and voice. I thought and planned more and obsessed less. The grammar and sentence structure…well, that’s something I can concentrate on next time. 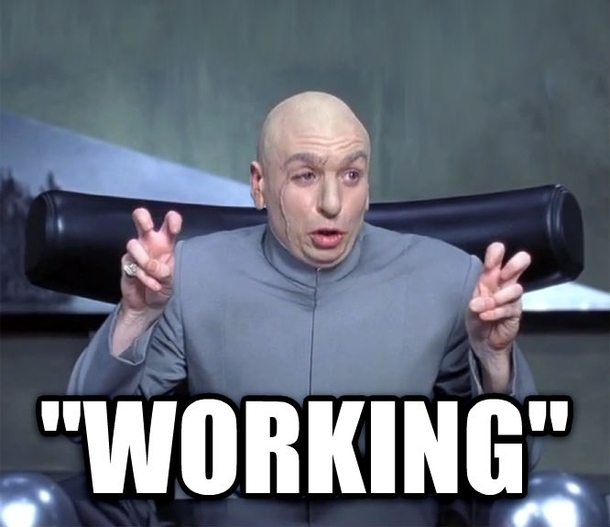 So I apologize if it may have appeared that I was off having a mini-vacation from this blog and work, I know when you see me tweeting excessively about #HRPA2015 it may look like I’m just goofing off, but the truth is that I WAS working, learning, developing skills, collaborating, and making connections. I know that these are not tangible and easily measured, they may not have been on my development plan or listed in my job description. I may not have been in the office, but I can assure you that I was working. You will just have to trust me on that. This post is dedicated to my fellow HRPA Conference bloggers – thank you for everything. 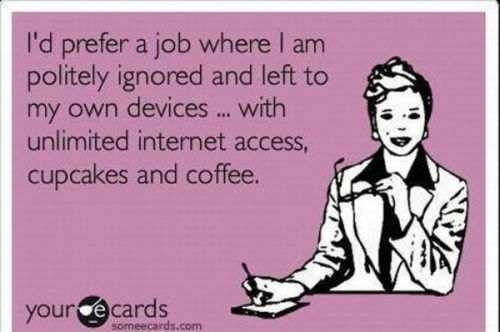 I would make HR better by…. I was recently approached by the inimitable Steve Brown about making a contribution to the January 2015 HR Carnival. Since I’m hellbent on selling myself out this year (see here), I thought why not? Well, that and the fact that it was a great opportunity to participate alongside other HR bloggers. We were give the challenge (I say challenge and not theme, because for me it was a challenge) of tackling how we could improve HR….. So without further ado…here is my Ms. HR Canada answer to: “I would make HR better by….”. I know that since it is January and everyone wearing their sweaters of good intentions, I should say something uplifting and profound about what I would do to make HR better. It’s a New Year after all. However, every time I sat down to write this post my mind would drift to comments that were basically a polite way of saying it needs a good swift kick in the arse. Does HR need to be made better? Is HR broken? Does HR need an upgrade? Is HR tired? I’m not entirely sure. What I do know is that HR people can always be better, some HR people are broken (or at least serious bent), and again, many HR people need to be upgraded – they need to be refreshed. What HR and HR people need is to not focus on rebuilding a new structure, but improving their attitude and remembering that we are here to be influential and involved in the business of human resources…people. Stop worrying so much about where you are sitting and focus more on standing up. (Btw – did you know that too much sitting has been linked to an early death? ) Just saying. Stop worrying so much about whether you should be on Facebook, Twitter, Tumblr, a blog, LinkedIn or Google+ and develop your actual voice and messages. Stop the navel-gazing, worrying about what we should be called, and the circular talking about things like employee engagement. Get out there and talk to non-HR people, learn something that doesn’t earn you credits towards your HR designation, and invest in something beyond your HR association’s L&D programs. The best advice I have received was from non-HR folk and some of the best work experience that I apply to my HR career was when I didn’t work in HR. You see there is a wide, wide world out there and for a group of highly connected folk, HR people can forget that. Go beyond the shire of Talent Management, the village of Compensation & Benefits, and the valley of Big Data. There’s a lot to be learned when you are walking around and talking to people. So to get back to the original opening line, I would make HR better by..well..giving it a swift kick in the arse. Have you ever been paralyzed by the sheer amount of options out there? I know, it sounds like such a first world problem. Oh, I’m not talking about what flavour of potato chip to pick (obvious choice: maple bacon) or which movie to see at the 24 screen theater (when in doubt I usual pick one I’ve already seen). I’m referring to the idea that we are now confronted with an overwhelming amount of choices and opportunities when it comes to education and careers. It almost seem impossible to choose. Do you do what you want? What your parents tell you to do? What your peers are doing? One of the “Best Jobs” found on one of the many lists out there? I draw my writing inspiration from many sources, and it was this post: Leaving Your Options Open Will Set You Back by Penelope Trunk that really resonated with me. It reminded of my grandmother. I remember her telling me that in the time and place when she was a teenager there were two options for women that wanted to work: finish high school and become a teacher or be a house cleaner. She ended up doing the later and working for a lovely family. No regrets…she had limited options and she chose the one that made the most sense for her at that time. Today’s new grads appear to have way more choices. I say “appear” because the truth is that with competitive academic requirements, limited enrollment space, and narrow job prospects, the reality is that their options are not unlimited. I’m sorry to be the bearer of bad news, but your parents misled you – you can’t be whatever you want. Even if you could decide. I see it with my own kids – the pressure to find and identify with “something”. It’s the early version of the dreaded networking question: “so what do you do for a living?”, except for them it’s: “so what do you want to do for a living? what’s your thing?”. And for some of these kids they may have an idea, but don’t want to commit, and for others, they don’t even know where to begin to sort through all the possibilities and options. And the advice they get: do what you’re good at…do what you are passionate about…do what makes you happy…follow your dreams….think about what you wanted to be when you were 9-years old. So where’s the problem? Shouldn’t guidance like that set them on the right path? This isn’t limited to students or new grads. Many of the more seasoned workers are feeling the same because it isn’t enough to just have a job and do it. There is a pressure to always be looking for more and the next opportunity (even if we don’t know what it is or even if we want it). Lemme know how that goes. I openly struggle with trying to figure out what I want to be doing. I’ve read so many articles, blogs, and books and filled out umpteen questionnaire, quizzes, and assessments. Each time I become frustrated and I freeze on certain questions. Questions like: “If you won $150 million dollars in the lottery, what would you do”. I don’t know……Read…Make muffins?…Plan a trip?…Laundry? The reality is that I might sit on my sofa and just come up with lists of things that I would like to do. The options may seem unlimited, but it’s that very factor that paralyzes me. Too many choices. Then I can focus on the options and even if I don’t like any of them, they provide me with a launch pad for my own ideas. In a world that can’t seem to stop upgrading and leveling-up, it’s a challenge to keep things in focus. There is a fear of making the wrong choice, fear of limiting yourself, fear of making a decision, fear of being obsolete even before you start. I’m not going all dystopian and proposing that we are born into assigned roles with no options, but maybe one way of dealing with the paralysis of decision-making is to stop telling ourselves and others that the sky is the limit, because in doing so we actually plant our feet deeper in the mud. Like millions of others I woke up late this morning resolved to be a better person in 2015. Then I opened my eyes, got out of bed, and resumed my pre-2015 life. I’m not a fan of resolutions, but I do like the idea of setting goals. One recurring goal that I have is to blog more frequently. I’ve tried various tactics: I promised myself I would blog twice a week, then I planned to blog Sunday nights for the upcoming week, then I went public with plan which resulted in the idea of Ruby Tuesdays, etc….and then stuff happens (insert excuse…I mean reason, here: ________________). What I need to do is go beyond talking about my goal and take action. So, to help me with this, I’ve signed on to be a part of the 2015 HRPA Conferences blogging team. Not only does this opportunity help me with blogging more regularly, but it also allows me to get out of my comfort zone. So in the spirit of New Year and resolutions, check out my pre-conference blog: “New Habits for a New Year: Conference-Style” here at LiveHR. While you are at it, take a look at some of the other contributions by my most excellent teammates.